I believe that marriage is big deal. I love love. I am also a self-admitted people watcher. These things combined make me really enjoy wedding photography! I also got married a couple years ago so I totally know what it’s like to be on the other side and it has fine tuned my approach. I am thorough, patient, knowledgeable and fun. I know how to help you make a successful timeline for your wedding day that allows me the time I need to make you killer art while also not turning your entire day into a photo shoot. I totally get the balance. And speaking of, epic pictures take time. They take trust. If your wedding day has a tight timeline and making time in the evening for pictures is not important to you, then I might not be the right photographer for you. And that's ok! I believe in quality. I believe in trust. I believe in taking risks. Masterpieces aren’t made by playing it safe. I have been known to lie in ditches, stand on chairs, climb trees and get elbows in the face on the dance floor for the sake of a good image. I am not afraid and at the same time, never intrusive. That trust between you and me takes time to build. I strongly suggest getting in front of my cameras before your wedding day. Or at least breaking bread together, sharing a beer or cocktail... shot of whiskey? I love light. I use it like a paint brush to sweep gorgeous warmth over you to emphasize the mood of the day. I use light strongly and I am not afraid! I also like the subtle balance of darkness, shadows, unexpected places. If you are more drawn to bright, pastel images, then I might not be the photographer for you. And that's ok! Your wedding is important. To you. To me. To your friends + family. And I take it as an honor. I also see it as an experiment. To do something different. To make simple, clean portraits that stand the test of time. That make you feel something. That show your spirit. That make you feel right back in that moment again. My style is a mix of creative fine art and photojournalism. It's about capturing everything from the billowing clouds above your ceremony; to the mountains surrounding a small farm wedding; to a foggy cityscape on a chilly morning; to the candle filled lamps and Italian string lights in the evening long after sunset. It's photographing the warm smiles of the people who come to support you , the tears at the ceremony, the details on the table tops, and finding the perfect light as we step away to capture you, married and in love, for the first time. It's about both of you, two people in love. These tiny moments are handmade and ornate, fleeting and entirely yours. I believe all of life is peppered with tiny moments of wonder.My goal is capture bits of that to tell your story. I'm delighted my work has caught your eye. Additional wedding day hours are $450 with package purchase. Wedding photos are about more than just the individual images. family heirloom which is why all of my albums are hand bound to last. for Flush Mount albums, or a linen or silk cover for Boutique Books. 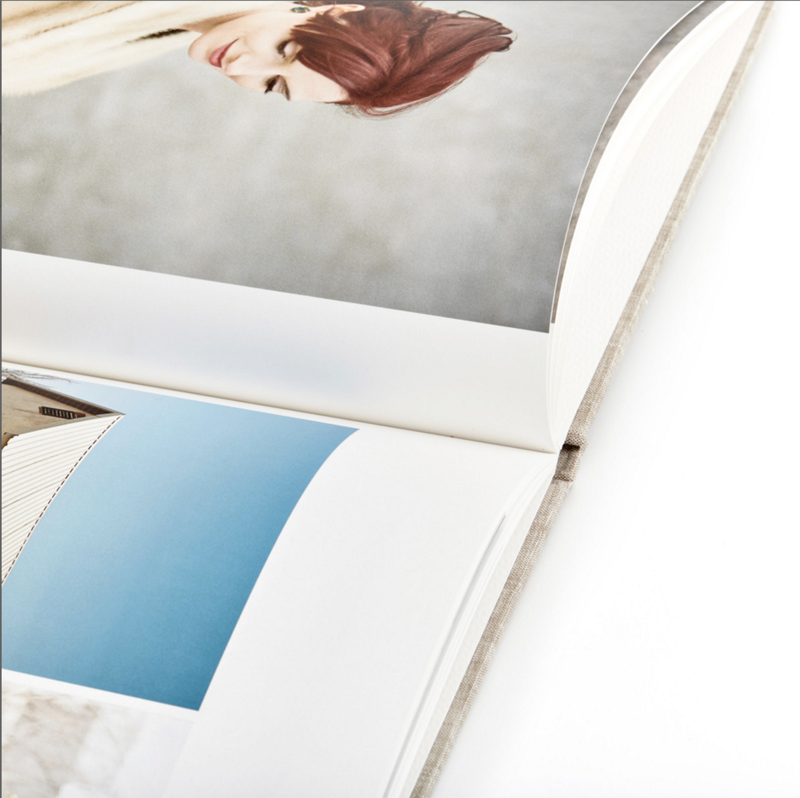 Printed on Mohawk Superfine Eggshell archival fine press papers, then bound into a beautiful linen or silk cover. 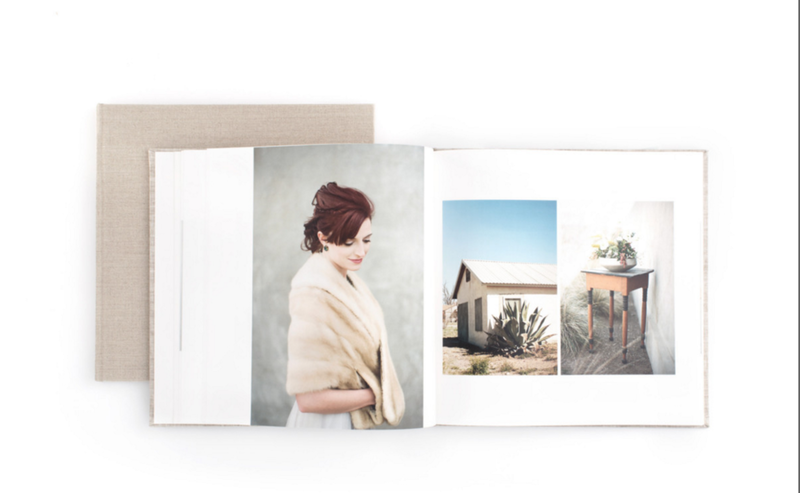 Printed on luster photo paper and then mounted to thick substrate, these heirloom albums lays flat and flush when opened. Proudly handmade in the USA and bound in leather or linen with many colors and customizations to choose from. We also offer Parent Duplicate Albums. allows you to easily view, share, print and download your images from any computer, tablet or smartphone with internet access. so feel free to take advantage of the privacy button. This allows you to mark any images for your eyes only. intended them to be, with the color and exposure spot on. I offer prints and wall art in every size. Your High Resolution images will be sent on a USB drive. What exactly is it? Isn’t it just an Engagement Session? These are the two questions we get asked the most. To me, when I hear the words “Engagement Session”, it conjures up visions of an overly posed couple with a perfectly placed hand, the new ring shining for the camera and 3rd grade, school picture smiles. And that makes me just shake my head. That’s just not me. And it’s probably not you either. I call it a Connection Session because it’s really a chance for us to make a connection before I show up on your wedding day. I want to get to know you. To really learn your story and for you to get to know me as well. This is also great practice for wedding day photos. with no cell phones, and no distractions just being with each other. And that’s how we go about it. Easy. Relaxed. You will learn my language, how I gently guide you without ever looking posed, how easy + fun it really is to be in front of my camera. If you would like to book a session but have no idea where to start, don't worry! I've put together a booklet to help you start planning your session. It includes everything from when the best time to book is (based on how you'll use the photos), how to pick a location and what to wear. people throw at me just as much as I love the trust of us choosing the location for you. Small travel fees may apply. Use this link to view a slideshow of a session from this February. q. Do you have any limits on coverage time? a: Not at all. If you would like me there for 14 hours and brunch the next day, I am all yours. I have special rates for full weekends with rehearsal dinner, day of and next day sessions. You may also add additional hours onto any Collection for $450/hour. q. How many pictures do we get and are they all edited? a: Connection Sessions average 40-60 images and weddings average 100 images per hour of event. Session images are delivered in 4 weeks and Wedding images are delivered in 6-8 weeks. q. Can we see some full weddings? a. Yes! There are some links at the bottom of this booklet. q. Can I add on an album or book after I book you? a: You can! Package upgrades are available anytime before the final balance is due. Albums purchased after the wedding may be subject to current pricing. q. When will my album/book be ready? a: After your wedding I will send you the Album Customization Booklet where you will decide what your album will look like and then select 75 images. I will design the layout with your images and any additional images that I think help to fill out the story. We will go back and forth with 3 rounds of redesign until you love your album- nothing goes to print until you love it! After the album is approved and any final balance is paid on additional spreads, the photos are then extra edited for little details and then sent to print with an estimated one month turnaround. q. Can we meet you before we sign contracts? a. Most certainly and I encourage it! I live in one of the most beautiful places in the Hudson Valley with great coffee shops, cute cafes and cozy pubs. I would love to share a drink let you flip through some albums and learn about what inspires you. If traveling here is not an option, we can always Skype or Facetime! q. How do we book you? What's the next step? a: I will send over my digital contract and you can fill it out online and sign it digitally too! Your non-refundable retainer is $1500. The second payment of $1500 is due 6 months before your wedding. The remaining balance is due 30 days before your wedding. I prefer checks or cash, however, credit card payments can be made through your online client portal. We know we've said it a million times already but as we settle into everyday life we wanted to thank you again for being a part of our wedding day! Everything from start to finish was absolutely perfect. You let us be ourselves while having so much fun and we know that the photos will be amazing! The next day teaser on facebook is stunning- thank you so much for that. Thank you for smiling and laughing with us through it all. And most importantly for being so kind and respectful to everyone you interacted with. Our friends and family had nothing but the highest compliments for your professionalism and personalities! “Pleased, satisfied, over the moon happy! Those words don’t even do justice to how happy I am with my wedding photographers. Sam was one of the first vendors I booked and it was the best decision we made. From the beginning, Sam was like talking to an old girlfriend, she made me feel comfortable and at ease about the whole process. She answered every question I threw her way and even suggested some tips that made our day even better. I knew that we weren’t just clients to her, that she really cared about us and about capturing our day in the best possible way. She never tried to up-sell us. I loved that she was willing to be there all day so I never had to worry about time. Even though we opted to not do engagement photos she insisted that we meet beforehand to make sure that we would be comfortable on the day of. We met her for drinks and had the best time! She instantly makes you feel at ease because she is genuinely an awesome person to be around. The day of the wedding, I was so happy to see Sam because I felt like one of my friends had just arrived. Not to mention, I knew she was going to capture some amazing moments. She went above and beyond on our wedding day. It POURED rain all day, didn’t stop once, and she still got some of the most amazing shots outside. She drove us all around the property and turned the rain into something to be desired, because she created magical images, using it to our advantage. She captured shots and moments that your standard photographer doesn’t catch. She shoots from angles that aren’t generic and the finished product is breathtaking. Also, the whole time you are having fun with her! At one point Sam and I were dancing together while waiting for our group to get together for a picture. Feeling at ease with your wedding photographer is so important because it really shows in the pictures. Nothing is forced and the results are so natural and beautiful. Finding Sam June was one of the best things that happened for our wedding. From our first email, I knew she was the one to capture our day. She is a gifted artists and totally understands how to capture a beautiful shot. Her love for what she does is visible in every one of her images. I have been so happy to work with her! She is quick to respond and so helpful with her answers. I can't say enough about how wonderful it was to have Sam be a part of our day. We were also SO glad that we added on the Connection Session- it was so much fun! We were able to capture some beautiful images. The photo booth was another great add-on to our day. I love looking through the pictures to see how much fun everyone had. I can honestly say that I feel like she became a friend, not just a photographer. Your images are forever. Make sure to find the right photographers to capture them. I know, without a doubt, that Sam June was the best choice we made- other than deciding to get married. This is Pine + Jeff. They got married on a Golf Course. Literally ON the golf course. It threatened rain all day but never actually did. The reception was in a cool, drafty, old barn. This is Amanda + Matt. They got married on the Penn State Campus. Their ceremony was in a very modern church and their reception was in a Ballroom. This is Caitlin + Kerim. They got married at a Private Estate on the Hudson River and their ceremony was on a staircase overlooking a pool. Their reception was outdoors under Bistro lights. This is Ben + Lindsey. They got married in a Vineyard in Upstate NY with the threat of rain. They got ready at the venue, married under a porch and reception in a tent. They got married on a golf course on a gorgeous summer day. Their ceremony was outside and their party was indoors. They got married on the edge of a river on a gorgeous late summer day. Their reception was in a beautiful chic barn with a bonfire outside. I am honored you are considering me as your photographer. I look forward to hearing from you!